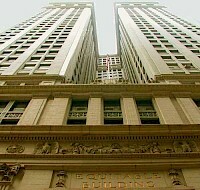 The Equitable Building is a 38-story office building in New York City, located at 120 Broadway in the Financial District of Lower Manhattan. A landmark engineering achievement as a skyscraper, it was designed by Ernest R. Graham and completed in 1915. The controversy surrounding its construction contributed to the adoption of the first modern building and zoning restrictions on vertical structures in Manhattan.